We're back safely from our holiday on Hadrian's Wall and, after doing the washing, cleaning out the car and restocking the fridge/freezer which defrosted while we were away, my mind is turning to quilty thoughts. I didn't do very much shopping while we were away but did get a few little treats. We visited the Forge Studios in Allendale and discovered a real treasure. Not only is there a collection of individual craftspeople based there but there are good quality exhibitions and a very nice café. I bought a scraps bag and some lovely threads with a project based on the area in mind and I collected various bits and pieces on our travels. I'm not sure how I'll be using them but I certainly had a lot of inspiration in the countryside. I was also unable to resist this throw from one of the English Heritage sites we visited. It's made in Britain, from recycled wool. 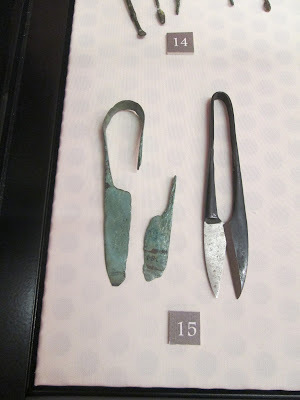 And finally, these Roman scissors ( below left) were found at one of the sites we visited and were exhibited with a modern pair alongside, good design never dates does it? The wool throw is lovely. It will be interesting to see what you come up with quilty-wise from all that inspiration. 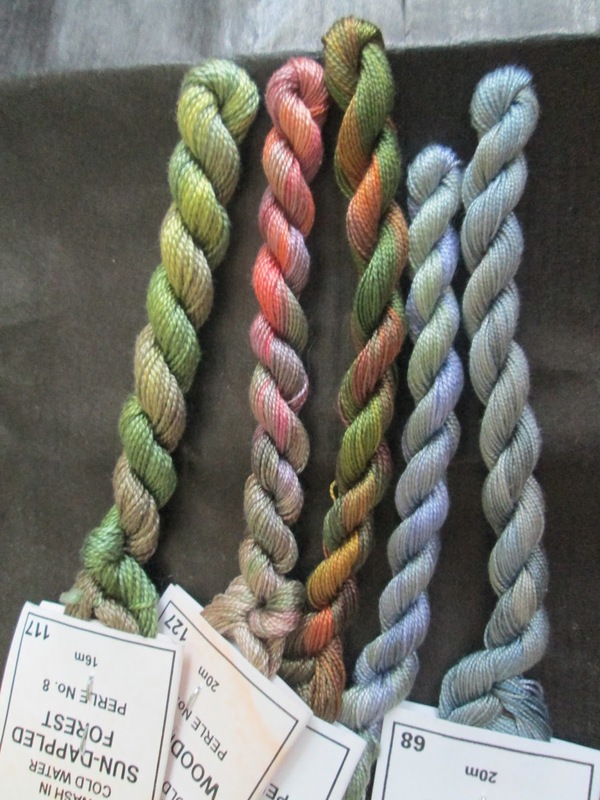 Those lovely threads certainly reflect the colours of the landscape there. Being away is nice and we need it to inspire the creative muse, but being home stitching is even better! Enjoy. What a delightful collection of bits and pieces. Some exciting things to come, I'm guessing. the scraps and thread are great, and I lo-ove the throw, it looks so cozy. the scissors are just like the Japanese hasami. I like reading your posts, there is a mixture of domesticity and craft: a complete universe.